Kim, a student from North Carolina, after discovering my site and my webquest Energy & Conservation, sent me this link to include as an excellent resource and reference on recycling.Thank you, Kim! Converting a MS Word document to a PDF then to a JPG file. General Rule of Thumb: There are a number of ways to do the same thing. The steps listed below are one way. You may be able to find other ways by Googling “convert ms word doc to pdf” and “convert pdf to jpg”. Read more: Converting a MS Word document to a PDF then to a JPG file. Forces are interesting. You can't see them, but you can observe their effect on other objects. Click here for Fibonacci PowerPoint presentation. Currently, I am discovering Moodle, a great online course management system. Cybersaftey is an important topic and students need to be aware of how they may put themselves at risk by using the Internet. Click on the image at left to go to my cyber safety program on my Moodle, or you can use the link in the top left of this page. I am excited to announce my WordPress blog. You will see a link to it in the top, horizontal menu, called SchoolTalk, or you can click on the image to the left. Feel free to explore it. To register, you will need a valid email address. I just love this guy. Funny ending. By 1977, many science fiction fans had tired of the fantasy style of science fiction then popular and were eager to see a newer generation of hard sci-fi novels come upon the scene. 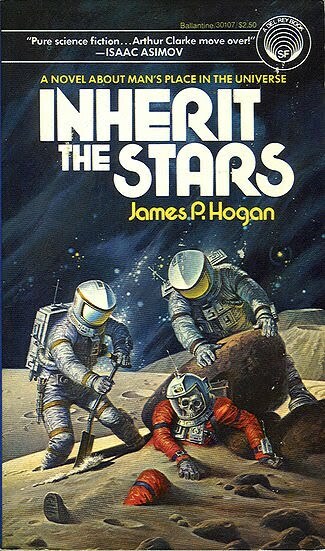 It was thus apt timing for Del Rey to release ‘Inherit the Stars,’ the first novel by British writer James P. Hogan.